We are excited to introduce the integration of HDInsight PySpark into Visual Studio Code (VSCode), which allows developers to easily edit Python scripts and submit PySpark statements to HDInsight clusters. For PySpark developers who value productivity of Python language, VSCode HDInsight Tools offer you a quick Python editor with simple getting started experiences, and enable you to submit PySpark statements to HDInsight clusters with interactive responses. This interactivity brings the best properties of Python and Spark to developers and empowers you to gain faster insights. Interactive responses brings the best properties of Python and Spark with flexibility to execute one or multiple statements. Built-in Python language service, such as IntelliSense auto-suggest, autocomplete, and error marker, among others. Preview and export your PySpark interactive query results to CSV, JSON, and Excel formats. Integration with Azure for HDInsight cluster management and query submissions. Link with Spark UI and Yarn UI for further troubleshooting. 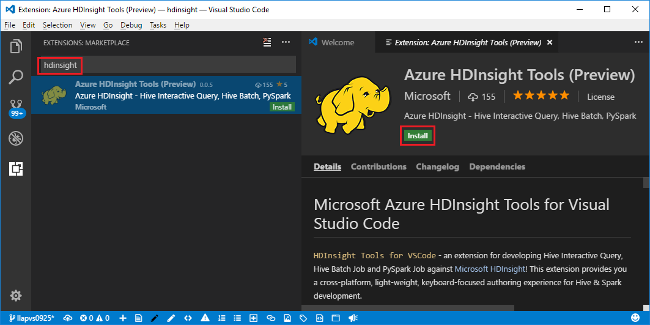 Simply open your Python files in your HDInsight workspace and connect to Azure. You can then start to author Python script or Spark SQL to query your data.